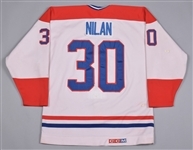 A member of a select group of only nine players that have registered more than 3000 career penalty minutes, Chris Nilan is well remembered for his proficiency with his fists, with his life and career prominently featured in “The Last Gladiators”, Alex Gibney's 2011 documentary film. 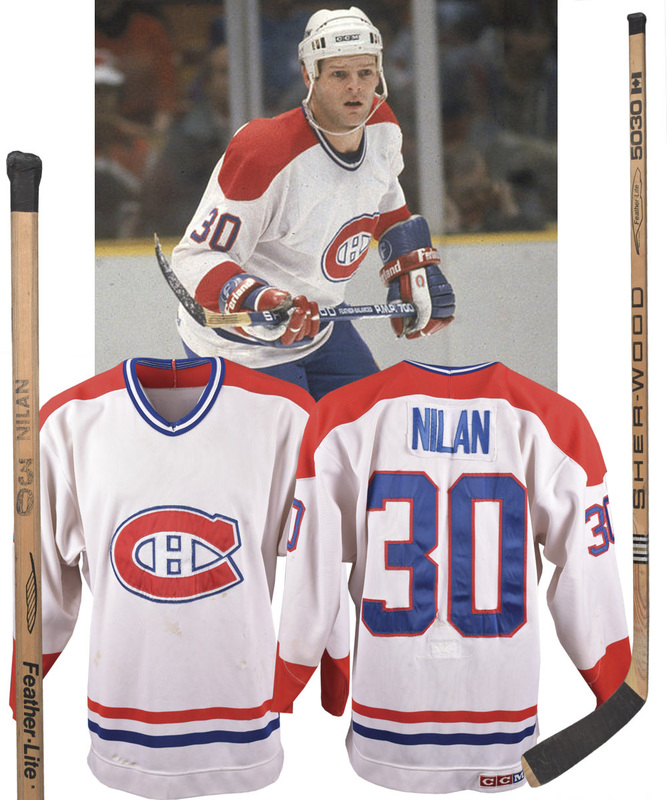 We have a Canadiens jersey worn by the tough guy circa 1984-85, along with a stick that saw action during his rookie era, in 1980-81. The jersey has no labeling and a loop-style fight strap and measures-out to approx a size 50, with an embroidered CCM crest over the bottom hem and tackle twill team crest, along with dual-colour sleeve and verso numbers. 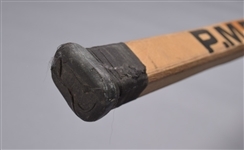 The stick is a Sher-Wood 5030 model with “Nilan” and “30” stamped-on, with the original black tape over the blade and handle. The jersey exhibits nice use, with marks and burns over each sleeve along with blood stains over the lower front, with small team repairs situated near each elbow and below the team crest. There is also a bit of threading missing from the nameplate, with red paint transfer over the left sleeve and lower right hem. 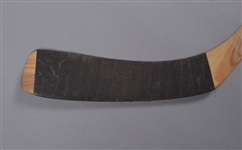 The stick has a “23 Fev 1981” date code along the underside, with just light use exhibited including wear to the underside of the blade and marks to the lower shaft.